January 2015 n Performance & Hotrod Business n 27 to help with fuel pickup in saddle-style fuel tanks. Further, most of the OEM assem- blies from the last decade have a design that allows the fuel pump assembly to act like an in-tank surge tank. The mecha- nism that maintains the fuel level within the assembly is driven either directly or indirectly by the output of the fuel pump." And Paitz explains how new fuel deliv- ery requirements are pushing his company and others to introduce new technologies. "Our patented, DC brushless fuel pumps allow for multiple speed con- trol inputs into a fully programmable fuel pump, creating highly efficient, on- demand fuel delivery," he says. What Else Is New Technology notwithstanding, other outside factors can have an impact on the fuel pump market. What have our sources seen? Deane has a strong link. "The megatrends in the auto industry for fuel economy and emissions have the biggest impact on our fuel delivery sys- tems. From a product side, the impact change in materials of magnets is high on the list as a key enabler. Putting these two things together means we can optimize fuel pumps in high volume to provide OEM car manufacturers with 0.6-percent fuel economy gains, while alternator electric current draw can be reduced 60 percent. This means efficiency, which is important on the road or track." Mills is watching the motors. "Engines are getting stronger, more powerful and cheaper. Horsepower is more readily accessible, both for street and racing applications. With higher power demands from customers and racers comes more fuel required by these hungry engines. 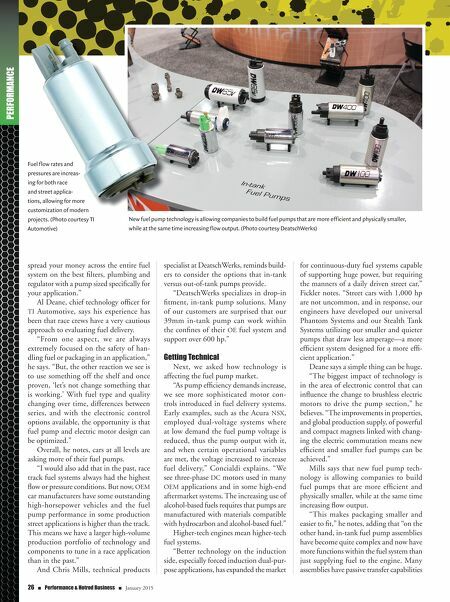 Being able to support most builds with in-tank solutions or compact external solutions keeps the DeatschWerks product offerings on the leading edge." 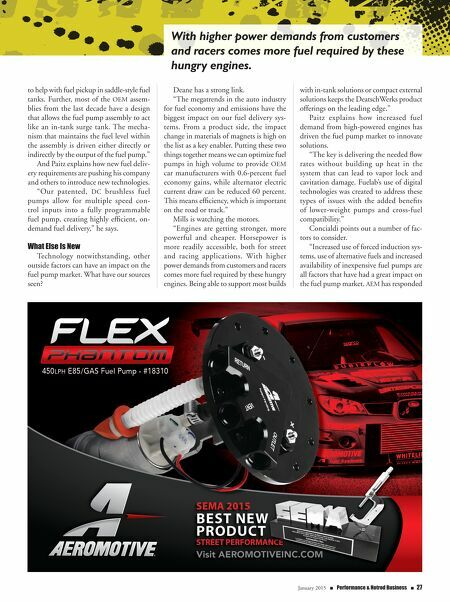 Paitz explains how increased fuel demand from high-powered engines has driven the fuel pump market to innovate solutions. "The key is delivering the needed flow rates without building up heat in the system that can lead to vapor lock and cavitation damage. Fuelab's use of digital technologies was created to address these types of issues with the added benefits of lower-weight pumps and cross-fuel compatibility." Concialdi points out a number of fac- tors to consider. "Increased use of forced induction sys- tems, use of alternative fuels and increased availability of inexpensive fuel pumps are all factors that have had a great impact on the fuel pump market. AEM has responded With higher power demands from customers and racers comes more fuel required by these hungry engines.